Bulawayo residents say they are at grave risk of contracting deadly diseases such as cholera and typhoid, unless the government urgently bails out their city council to replace its decrepit sewer and water infrastructure. This comes as virtually all local authorities in the country are grappling with similarly antiquated sewer and water reticulation equipment, which requires hundreds of millions of dollars to replace. It also comes after Harare was last year hit by a deadly cholera outbreak which left dozens of people dead and many others hospitalised, after much of the drinking water in the capital was contaminated by bacteria from raw sewerage in high density suburbs. Bulawayo Progressive Residents' Association (Bupra) coordinator Emmanuel Ndlovu told the Daily News yesterday that the Bulawayo City Council (BCC) had been crippled by acute shortages of foreign currency to service its infrastructure - which meant that it required urgent help from the central government. "Central government should come in to rescue … what is happening now is just a symptom of the worst that is yet to come in the near future, unless something is done urgently. "While we accept that the council is trying its best in light of the prevailing foreign currency shortages, serious challenges have been noted in the areas of refuse collection and burst sewer pipes. "It has been noted that the infrastructure is dilapidated, and there is need to totally remove the old piping and replace it with new infrastructure. "The council budget … has no allocation for investment in infrastructure … all that we see is maintenance works, repairing and re-painting," Ndlovu told the Daily News. He said burst sewer pipes had become "such an eyesore" in some of the city's old suburbs - emphasising further that the infrastructure needed to be replaced urgently. In the latest BCC minutes, councillors from various wards in the city complained bitterly about burst sewer pipes in their areas, accusing the local authority of taking too long to address the situation. "Despite several reports to the relevant department, nothing had been done. To worsen the situation, people doing business around Mashumba beer garden were now relieving themselves in the open because the public nearby toilet was locked," Ward 8 councillor Ronniah Mudara said. Councillor Tinevimbo Maposa also reported that there was almost a total collapse of sewer infrastructure in his ward. 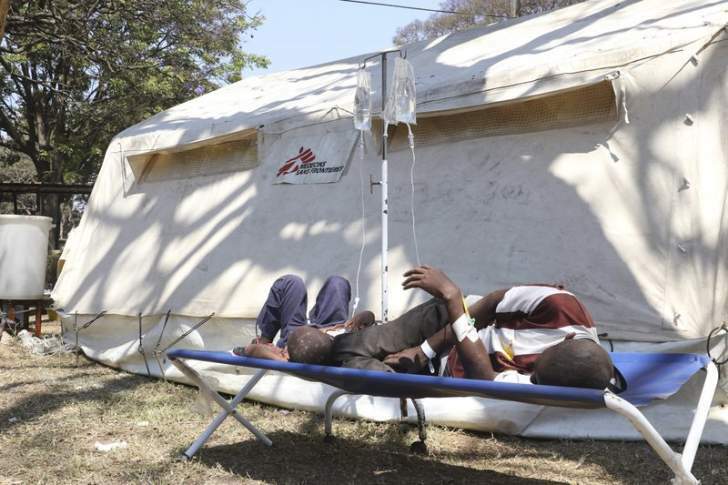 In September last year, Budiriro and Glen View townships in Harare were rocked by a deadly outbreak of cholera which killed dozens and left more than 100 people needing treatment. The cholera outbreak came as the capital city was battling to contain typhoid, which had killed 10 people at the time. Zimbabwe was in 2008 hit by a deadly cholera outbreak which killed more than 4 000 people nationwide. This was arguably the worst such outbreak in the country in living memory. This was blamed on poor public health services and policies, as well as on the country's dysfunctional water and sanitation infrastructure. Cholera is an acute diarrhoeal infection caused by the ingestion of food or water contaminated with the bacterium vibrio cholerae. It is an extremely virulent disease that causes severe diarrhoea. It takes between 12 hours and five days for a person to show cholera symptoms after ingesting contaminated food or water.